There were two basic types of high-rises in New York in the period before the passage of the 1916 zoning law that changed the formula to stepped pyramids: the slender tower on a small site, such as the Flatiron, Times Tower, Metropolitan Life, or Liberty Tower; and the big block, generally a tall rectangle built on a site so large that the mass needs a light court. 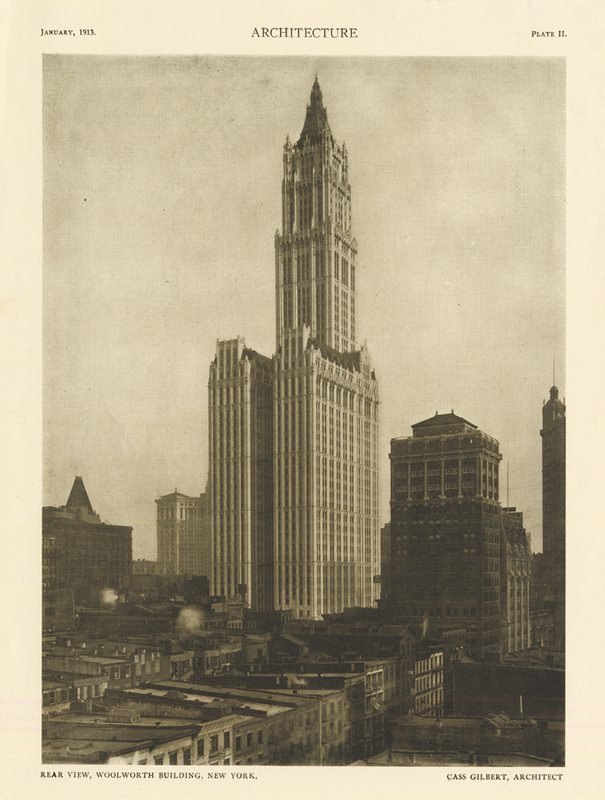 This rear view of the Woolworth Building seen from the west shows that it combined the two types in a single gigantic structure. Like the Adams Express Company or Equitable Building, with its H-shaped plans with light courts front and back, the Woolworth had a deep light court cut into the block so that daylight could reach the offices that otherwise would have been too far from windows. Woolworth's U-shaped court did not produce the most efficient floor plans to maximize rentable space. Altogether the building enclosed 983,000 sq. ft. of floor area, but only 563,000 sq ft was leasable office space, a ratio that was below average for an office building. The contrast of the scale of the skyscraper with the low-rise blocks to the west, stretching all the way to the Hudson, make clear the market value of the lots along the spine of Broadway.